This movie went to DVD fast and for a reason - it was painfully awkward and went in so many directions you couldn't wait for it to end. Dwayne Johnson, also known as "The Roc" is a very funny comedic actor, but only when he has something to work with and this script wasn't it. He stars as, Derek Thompson, a second-tier hockey player in Lansing, Michigan, that has settled for mediocrity, after a career changing injury knocks him out of the big leagues. Due to Thompson calling himself "The Tooth Fairy" the real so-called tooth fairies, based on the childhood myth that people con their children into believing, make an appearance in his life. They force him to become a tooth fairy, with his wings and very, er, delicate blue satin suit, replete with tights, involuntarily appearing on him at the worst times. This affects Thompson's relationship with his girlfriend and his mentoring of her two children, not to mention his career. Furthermore, the presence of the word "fairy" coupled with that of a very effeminate, limp-wristed sidekick, a dude named Tracy, this film was begging for certain types of jokes to kick off at this movie's expense. 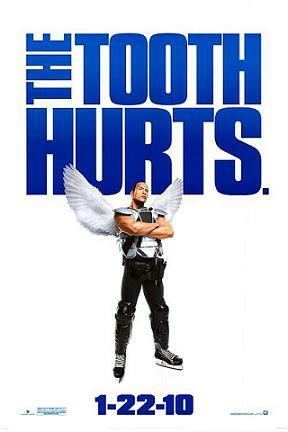 "The Mighty Ducks" was a more entertaining, age appropriate hockey film that didn't try to force kids to believe in something that doesn't exist - the tooth fairy.